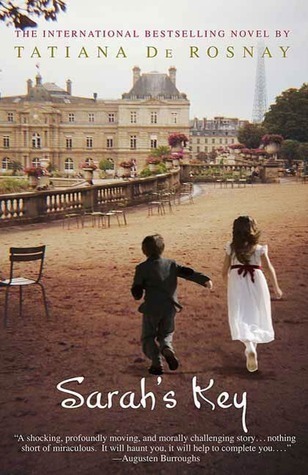 Or Elle s’appelait Sarah [e: Her Name Was Sarah] as it is called in the original French version, is a melancholic tale about a Jewish girl, Sarah, and the effects the Holocaust has on her life. Two stories unfold from two different time periods, and will eventually converge in an unexpected way. The first story is set in France during the German occupation in 1942. We are thrust into a little apartment of a girl named Sarah. She is awakened by a loud pounding on the front door. She goes to her mother, who opens the door, and they are told that they are leaving and that they ought to collect some belongings. As Sarah quietly retreats back to her bedroom, we meet her younger brother, Michel, who sits in a cupboard in the wall. It is their special hiding space. He tells her that he will stay behind and hide, that he will be safe. Quickly, Sarah agrees by locking him in the wall of the apartment, shielding him from the terrors she is about to witness and with this single act exposing him to other terrors she will never know. Her family then begins their dark and horrific journey to Auschwitz. Interspersed between Sarah’s story, we meet in present day Paris, Julia Jarmond. An American expat journalist living in Paris, Julia’s marriage to her husband is strained and she feels something is missing in her life. Then she is given the chance to write about Vel’ d’Hiv Roundup, since the 60th Anniversary of this tragic time is coming up. Through her research, Julia stumbles upon Sarah’s story and also upon the history of her husband’s family apartment. She feels a compulsion to remember. To unearth all the memories and secrets from the past. To somehow make sense of Sarah’s story and what became of her. And its through Sarah that Julia finds what has been missing in her life. The beginning of this book draws you in, gets your heart pounding, and makes you clench the pages tighter as you read through Sarah’s story. There is a heaviness that accompanies Tatiana de Rosnay’s writing on the subject matter. It is good there is the lightheartedness of Julia’s rather ‘ordinary,’ story in comparison to break up the flashbacks. The writing is descriptive and the word choice is deliberate. The sections are short and this is a book that can quickly be devoured. I really enjoyed the juxtaposition of past and present. It might seem like a method of writing done many times, but this story is wholly unique. I give it four stars and high praise. I recommend for anyone who enjoys reading historical fiction or fiction that shows how the past informs the present and the future. Until next time bookish buds!